Winter can be a drain on us all. Short days, heavy cloud, rain and snow – these all work to bring us down, even though we have a warm, dry home. The same is true for the plants that share our homes. In fact, they are much more sensitive than we are to the lower light levels. It is deceptive, because our eyes adjust to lower light, and we don’t really notice that light levels in winter are only one-quarter of what they are in summer. We may only sense a dimming, but for plants the difference s dramatic. No wonder so many plants simply give up, drop their leaves and go to sleep until the brightness returns in spring. Plants in our homes already live in low light-levels, but we have chosen varieties that are adapted to that, so they can cope much better that sun-loving plants might. But winter brings more problems than just low light, so by the time winter has been with us for a while, we often see our plants suffering. To help them do better, this winter and in the coming ones too, let’s look at the problems and some solutions, so that your house plants will come through the winter happier and healthier, bringing welcome green life to our homes all year round. As we mentioned, light in winter is only one-quarter of what it is in summer. Add to that the low sun, so that a sunny window in summer is often a shady one in winter. Add to that the shorter days, and it is easy to see why your plants might be suffering. They cannot produce so much food, with just a few hours of weak light, so we can’t expect them to grow much, or even at all. Our goal is winter should be to help them rest, so they don’t waste food reserves on new growth that will be weak, and a burden on the rest of the plant. More on that in a moment, but for low light levels there are two things we can do. The first is to move plants into better lit places. The plants further back in your room could be moved in front of a window, so they have light closer to that they receive in summer. The second is to put in artificial lighting. Normal indoor lights rarely make any difference to plants. To begin with, they are usually too weak, and secondly the wavelengths of the light don’t match very well with what plants need. Adding a specially-designed grow-light for your plants, on the other hand, will make an enormous difference. Modern LED technology has revolutionized plant lighting, and today it is easy to put a small light over a favorite plant and really boost its growth. It is best to run the light for 16 hours a day if you can – LEDs consume very little electricity. Place the light as close as possible to the plant – the intensity falls rapidly as we move the light away. If you find the lighting harsh, you can install a timer. and have it run at night, while you sleep. Some plants, like ferns, will be damaged by lack of water, but they don’t need much light anyway, so this is not so much of an issue. Most other plants will come back quickly if they have only wilted a little, so don’t be afraid in winter to use wilting as an indicator of when water is needed. Some plants may lose a few older leaves if they become dry. Again, some leaf drop in winter is normal. With central heating, the air in our homes in winter is usually very dry. Besides causing problems for us, so that some people use humidifiers in winter, that dryness causes problems for our plants as well. The tips of the leaves may turn brown, and around the edges too. Low humidity also encourages pests like red spider mites, that will damage the leaves. If you do use a humidifier, placing it beside your plants will help them a lot. If you can’t do that, then keep a spray bottle beside them, and give them a quick spray every time you pass by. You can never overdo it. If you have your plants in a sunroom or porch, you can install a simple mist-spray line on a timer, to keep your plants truly happy. This is a hard one to deal with, since most of us like to keep our homes warm and cozy in winter. For our plants, lowering the temperature is another way to keep them dormant, and so keep them healthier. This is especially important with plants brought in for the winter from outdoors, like citrus, or camellias. These do much better with low temperatures – 50 degrees is ideal, and for most plants, if it happens gradually, 40 degrees is fine. Obviously, we aren’t going to keep our homes that cold, but if you have a room you don’t use much, and can turn the thermostat down in it, then keep your plants in there for the winter. The ideal for citrus is a cool, sunny place. Putting them into a glassed-in porch or sun-room is ideal. Put a heater on a thermostat in it, to come on when the temperature falls to 50 degrees. This is certainly the ideal thing, and your plants will go through winter so much happier. This one is easy. From November to early March, stop all fertilizer use. 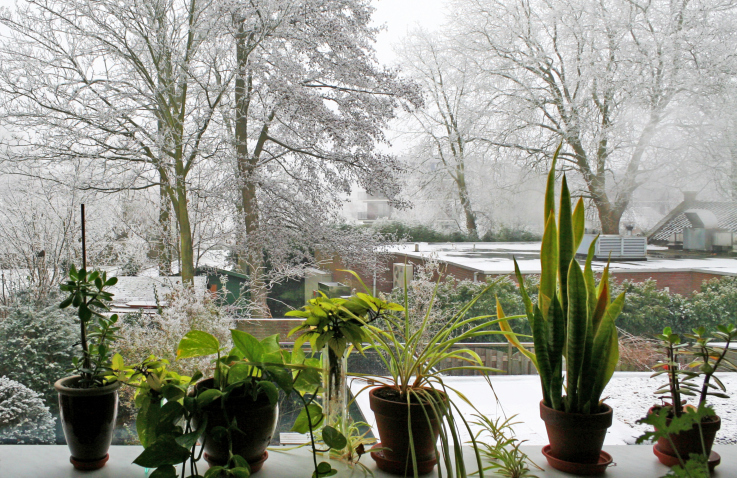 This is another way to encourage that all-important dormancy in your plants – the secret to winter survival. By March the days will be noticeably longer, and the light will be stronger too. That is the time to do any necessary pruning and re-potting, resume feeding your plants, and start watering more regularly. Before you know it, your plants will be the picture of health again, and in their best condition ever. Taking care of them in winter is the key to good long-term growth and plant health.